The link that brought you to this page and the page title are a bit of a misnomer, because this short report is not long enough to cover so many chapters of the Bible. What the link and the title do, however, is track where we are in our plan to read through the entire Bible in 1 year. May each report pique your interest and help you to draw near to God. The Bible, James 4:8, tells us if we do so God will draw near to us. A map is at the end of the report followed by a Works Cited page. Internal links provide additional information. ​BIBLE READING—WEEK 37—EZEKIEL 34 - DANIEL 6: Last week we looked at many of the chapters and verses of Ezekiel where doom (judgment) is brought against Israel and the nations that encompass Israel. In this past week’s readings we finished the last 10 chapters of Ezekiel and started reading Daniel. This week’s Short Report looks at Ezekiel chapters 38 and 39 where the focus is Gog and Magog. In addition, the people of the north and the people of the four corners of the earth are considered. A minor point last week was the vivid word pictures and symbolism used in parts of Ezekiel that have parallel passages in the Revelation to Saint John. To illustrate that, the four living creatures in Ezekiel 1 and 10 were shown to be a part of one of John’s visions in Revelation 4. This week we see that Ezekiel 38 and 39 are also in Revelation 20. Keith B. Kuschel, in his introduction to Ezekiel - People’s Bible Commentary, tells his readers, “The book of Ezekiel is a mixture of poetic, artistic description and detailed prose” (p. 4). I won’t argue with that, but I will let R. Reed Lessing, from his book, Prepare the way of the Lord, add an important ingredient to the mix, namely, apocalyptic writings. Lessing says apocalyptic writings have three “characteristics: (1) revelation is mediated by heavenly beings to select persons through visions, (2) the context has a temporal axis concerning the past and present with a particular accent upon an upheaval in the future, and (3) it is written in a way that makes it accessible only to people perceived as insiders. Biblical sections that are apocalyptic include Dan 7-12, Ezek 38-39, and Rev 4-22” (p. 425). As with other apocalyptic writings there is no shortage of ideas concerning the interpretation of these 2 chapters of Ezekiel, especially when it comes to understanding who or what Gog and Magog is. Unlike Genesis 10, which lists the descents of Noah, Ezekiel 38 does not try to provide lineage, although it lists many of the descents of Noah’s sons Ham, Shem, and Japheth. 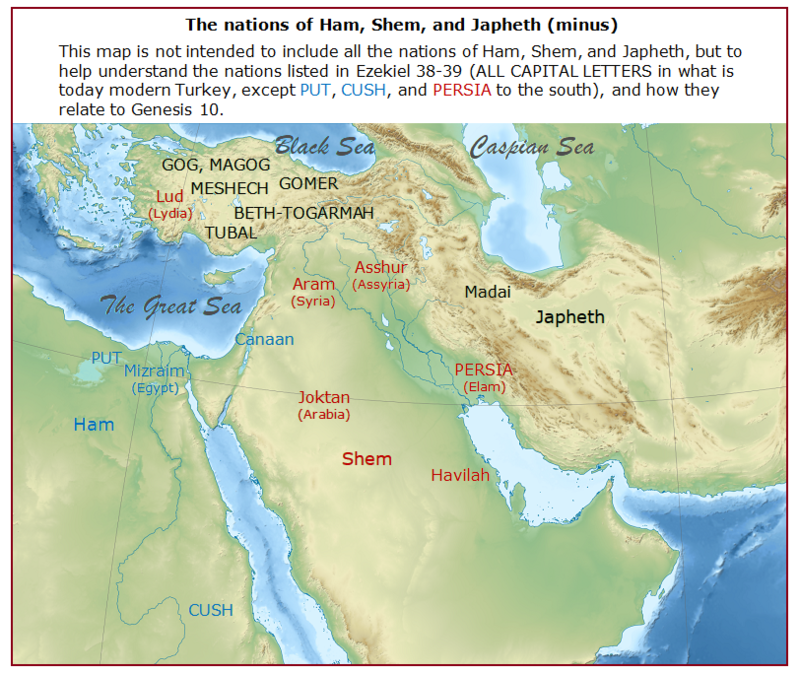 According to most modern Bibles, including the English Standard Version, the sons of Japheth include Gomer, Magog, Tubal, and Meshech (Genesis 10:2); Togarmah is a son of Gomer (v. 3), and among the sons of Ham are Cush and Put (v. 6). In Ezekiel 38:2, when God tells Ezekiel to turn his attention to Gog, several tribal names from Genesis are listed that represent the evil against God’s people in verses 2-6. They include Gog, Magog, Meshech, Tubal, Persia, Cush, Put, Gomer, and Beth-togarmah. Beth is Hebrew for house. Bethel means the house of God and Bethlehem means the house of bread. Accordingly, Beth-togarmah is the house/place of Togarmah. According to the New King James Version one name is missing, Rosh, which is grouped together with Meshech and Tubal. The NKJV is not alone, the New American Standard Bible (NASB), Modern English Version (MEV), and the World English Bible (WEB) also use Rosh as a proper name rather than an adjective to modify prince. Rosh means “head” or ”chief” (Myers, 894), but Rosh is also used as a proper name in Genesis 46:21 where Rosh is listed as a son of Benjamin. ​The NIV Bible Commentary explains that “Rosh presents the major difficulty in the phrase. Its normal meaning was ‘head’ or ‘chief.’ Some understand it as a proper noun, a geographical area named “Rosh,” but there is no evidence that a country named Rosh ever existed. Some would understand rosh as modern Russia, but the word Russia is a late eleventh-century A.D. term” (Barker, 1335). I accept this rational thinking, but also note that it brought to mind two more points: (1) Critics have come forward in the past to say, “There is no evidence that this ever existed,” but Biblical archeology later provided the evidence, so it is wise to use caution with the “no evidence” position, and (2) while the Rosh-Russian connection is weak, what were the various tribes, peoples and nations of modern Russia called before 600 B.C.? would any of them indicate a possible connection to Rosh? The two points I make are not intended to lend support to the “Russian connection.” I add them to indicate that the argument against Russia and Gomer as the nations from the north (Ezekiel 38:6) could be strengthened, if they were answered. Briefly, the name Gog can be applied to three people in the Bible: (1) An offspring of Reuben named in 1 Chronicles 5:4, (2) “The chief prince of Meshech and Tubal” according to Ezekiel 38:2-3 (or, in the NKJV, the prince of Rosh, Meshech and Tubal), and (3) Together with Magog, Gog will be a leader of the nations deceived by Satan and battle against the saints (Revelation 20:7-9). This is similar for Magog, which is also applicable to three people or places in the Bible: (1) a descendant of Japheth (Genesis 10:2), (2) the land of Magog (Ezekiel 38:2-3), and (3) a leader among the nations of the four corners of the earth that is deceived by Satan (Revelation 20:7-9). All of this is to say that the Scriptures themselves, and not twentieth century commentaries on current events, must provide the normative interpretation of Old Testament prophecy. Ezekiel 38-39 predicts that Gog of the land of Magog, chief prince of Meshech and Tubal, along with Persia, Cush, Put, Gomer, and Beth-togarmah will make war on Israel. Dispensationalists often identify these with the twentieth century countries of Russia (Meshech=Moscow, Tubal= Tobolsk), Iran, Ethiopia, Libya (Put), Germany (Gomer), and southern Russia (Beth-togarmah) and say that these countries will attack the modern Israelis.14 The New Testament, however, interprets these references typologically by viewing these enemy nations of Old Testament Israel as illustrative of all the godless world which is hostile to the church and will intensely persecute the church for a short time before Judgment Day (Rev. 20:7-10). 14Hal Lindsey, The Late Great Planet Earth (Grand Rapids: Zondervan Publishing House, 1970), 59-71. However, these identifications are not historically accurate. Meshech and Tubal, for instance, were located in central and eastern Anatolia. See Edwin M. Yamauchi, Foes from the Northern Frontier (Grand Rapids: Baker Book House, 1982). While we should be skeptical about some, even much, of the scholarship involved in deciphering what we are being told in Bible prophecy, especially in the light of “The End Times Study on Eschatology and Millennialism,” we should not be outright dismissive, which is a position that Kuschel takes when he says, “Although many attempts has been made to link the name Gog with some particular ruler, people or city …” Still, his conclusion is that Gog “actually was on the scene in history” and was in opposition to God’s people, but Ezekiel is only using him as a symbol of the forces that remain committed to eliminating the people of God (p. 225). Lessing agrees with Kuschel that Gog was a real person in ancient history. In addition he explains that Gog and the nations of the far north “were shrouded in mystery,” and what information Israel had of these people showed them to be “brutal and barbaric kingdoms. This combination of mystery and brutality made Gog and his confederates perfect symbols of the archetypal enemy rising against Yahweh and His people” (p. 426). On the other hand, Lessing offers two possible answers to the identity of Gog. Like Kuschel, Lessing and his co-author, Andrew E. Steinmann, are published by Concordia Publishing House and no doubt hold to conservative Lutheran positions, including those found in “The End Times Study on Eschatology and Millennialism.” Even so, it would seem that his study of the subject caused him to research many leads and he provides the two best answers he discovered. “One explanation,” he says, “for Gog’s identity is that it derives from Gyges, the name of a Lydian king mentioned in six inscriptions of Ashurbanipal (668-631). Magog is then a reference to the territory of Lydia in Western Anatolia” (p. 425). The Gog-Gyges connection is a common one, but some scholarship, like the International Standard Bible Encyclopedia feel it is unclear and says, Gog “has been identified with Gugu, known in his own land of Lydia as Gyges, and mentioned in the records of Ashurbanipal. The phonetic similarity is too uncertain for positive identification, however” (Olive Tree). Lessing does not need me to defend him, but I will give this clarification: I did not use all of the material Lessing offered. He only uses historical facts, and makes no attempt at a linguistic connection. Lessing’s second possible answer to the identity of Gog comes from another author. He writes, “Odell offers another attractive explanation for Gog. She argues that it is an obscure allusion to Babylon. A comparable cryptogram appears in Jer 25:26; 51:41, where Babylon is called Shishak.” He also explains that the code used here is different but is based on a similar principle of switching letters. Next, the substituted letters are placed in reverse order. He concludes by saying, “Theologically and historically this makes sense when one understands that Ezekiel applies the Gog/Magog oracles to announce that Israel’s exile in Babylon is only temporary (Ezek 39:25-29). The regime will be defeated” (p. 426). Looking at a map it is easy to identify the northern nations. Ezekiel 38:6 says “Beth-togarmah from the uttermost parts of the north with all his hordes,” and 38:15 says Gog will come “out of the uttermost parts of the north.” Some modern researchers want uttermost to mean Russia, but that seems a stretch, especially when we’ve already shown that Hal Lindsey was not historically accurate in his placement of Meshech and Tubal. We must also keep in mind that our use of words are not always precise and uttermost is a relative word—your uttermost reach may well surpass mine. In closing, this short report looked at Gog, Magog and the nations listed in Ezekiel 38-39 and noted they come from the Table of Nations in Genesis 10. It also showed some of the problems surrounding these verses because of translation and word meaning, and theories based on current events that may be the cause of “finding” some of the nations in Europe rather than letting Scripture interpret Scripture. Barker, Kenneth, L., and John Kohlenberger III (Consulting Editors), Zondervan NIV Bible Commentary: An Abridgment of the Gold Medallion-Winning Expositor's Bible Commentary, Volume 1: Old Testament. Zondervan Publishing House, 1994. “End Times Study on Eschatology and Millennialism, The.” The Lutheran Church Missouri Synod, September 1989. Note: this link is a direct download of the LCMS CTCR. International Standard Bible Encyclopedia (ISBE) 4 Volumes, 2nd ed. Bromiley, Geoffrey W., (Gen. Ed. ), For the Olive Tree Bible App. Note: Christianbook also carries this book. Kuschel, Keith B., Ezekiel – People’s Bible Commentary. Concordia Publishing House, 1995. Lessing, Reed, R., and Andrew E. Steinmann, Prepare the Way of the Lord: An Introduction to the Old Testament. Concordia Publishing House, 2014. Wikimedia Commons, the free media repository: Near East topographic map-blank.svg. Web. 13 Sept 17. Note: map modified under Creative Commons license.